With all the talk about which diaper cream to use, I was wondering if anyone has tried to make their own? 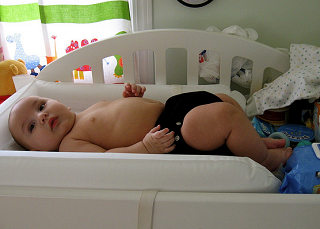 I did with my first (wasn't cloth diapering though) and loved it. Below is the recipe I used from a book called, Natural Beauty at Home. Combine beeswax and oil in hot water bath (double boiler like set up) and heat until beeswax is melted. Then add in lanolin, heating until melted. Remove from heat. In a separate container add distilled water, witch hazel, and borax. Mix to dissolve borax and heat until just boiling. The microwave works great for this part. Slowly pour the water/hazel/borax solution into the heated wax/oil while stirring briskly with a wire whisk until a thick cream starts to form. Pour quickly into a wide mouth container. NOTE: this is a VERY thick cream, not pourable at all. When my son was an infant I didn't add any scents. As he got older I would add one of the following essential oils: lavender, chamomile, tea tree. I'll be making a batch of this soon in preparation for the second child. Thanks to Hope Martin for this Frugal Baby Tip!